If you are running out of ideas for Valentine's Day gifts, have you thought about treating your Valentine to a special breakfast? Maybe even breakfast in bed!! Oooo...now that is something that I would love. :) I remember as a child making my mom breakfast in bed. Oh my, the things we would think of to put on her tray! I think we included foods like Pringles, toast, cereal, juice, eggs, etc. Looking back, she was always sooo gracious and would never complain about the menu (even when we poured the milk on her cereal 1/2 hour before we took the tray to her.). Bless her heart. :) I cannot remember the last time I got breakfast in bed; usually I am up getting the children breakfast before hubby wakes up so I have yet to experience this! If I were to be treated to such a luxury, I know I would want a nice hot cup of coffee on my tray. So, if you are looking to surprise your Valentine with a special morning, I have a wonderful coffee company to introduce you to today! They will get you on the right track if you are looking for the perfect cup of coffee. Green Mountain Coffee Roasters, Inc. (GMCR) was founded in 1981 as a small café in Waitsfield, Vermont. In 1993, the Company went public (NASDAQ: GMCR) and that same year made an early investment in Keurig, Incorporated. GMCR acquired the remainder of Keurig in 2006 and the combined company is changing the way North America prepares its beverages both at home and in the workplace with its Keurig® Single-Cup Brewing System. Today, GMCR is recognized as a leader in specialty coffee and coffeemakers, and acknowledged for its award-winning coffees, innovative brewing technology, and environmentally and socially responsible business practices. I have always admired the Keurig Brewers and think that they are soooo great! I don't own one...yet, but hope to sometime in the future. How convenient that you can brew a fresh cup of coffee each time you want one? To me, that is ingenious! 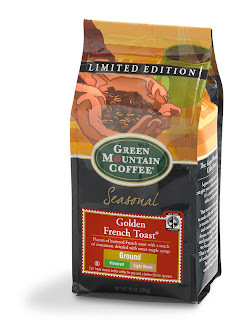 So, for this review I was sent a VERY tasty bag of Green Mountain Coffee in the Golden French Toast flavor! I am a huge French Toast fan, so I was very eager to see what the flavor of this coffee tasted like. I also might add that because I am pregnant, I do not indulge in coffee very often so this was a treat! When I first opened the bag all I could say was "Wow!" The smell alone was enough to get my mouth watering. This coffee comes already ground, which works great for me as I do not have a coffee grinder. I started my pot of coffee and jumped into the shower. While I was showering, I could smell the coffee brewing and it smelled JUST LIKE French Toast!! I knew this was going to be a great cup of coffee. As I thought, the flavor of the Golden French Toast was just like I imagined. I could taste all aspects of French Toast...syrup, butter and cinnamon. It was SO good! My children must have liked the smell as well because they kept asking for a taste. Ha ha! 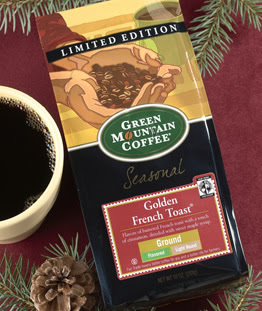 Golden French Toast from Green Mountain Coffee retails for $9.49 for a 10 ounce bag. It also comes in K-Cups. So, in my opinion..Golden French Toast coffee from Green Mountain Coffee is pretty amazing. I love how the flavor is just like eating a hot stack of French Toast. As someone who loves coffee, I am becoming a fan more and more of flavored coffee and believe me, Green Mountain Coffee is on the top of my list now! Disclaimer: I received no monetary compensation for this post. I did receive a free bag of Golden French Toast Coffee for review purposes. All quotes and stock photos are from the Green Mountain Coffee website and email. Prize is being shipped by the sponsor. All thoughts and opinions are 100% mine. I want to try columbian fair trade select. I would like to try Green Mountain Breakfast Blend K Cups. I wouldlove to try the Chai Latte! I would like to try Green Mountain Coffee's Fair Trade Organic French Roast coffee. the Dark Magic Espresso roast! I would like to try the nactucket blend. I want to try the Sumatran. I would like to try the Huehuetenango blend. I think the caramel vanilla cream sounds delicious! We love Columbian coffee, so I will pick the Columbian fair trade select. Unable to post GFC name on form-my GFC name is dwellenstein. Drooling over Fair Trade Wild Mountain Blueberry! YUM! I'd like to try the Breakfast Blend. I'd love to try the WIld Mountain Blueberry. I'd love to try the Dark Magic Espresso roast. I LOVE Green Mountain Coffee -- we even went to their museum on our honeymoon! I'd like to try their Chai Latte. I would like to try the Café Escapes® Chai Latte. I like Milk Chocolate Hot Cocoa, pass the marshmallows! I would love to try the Dark Magic® Espresso Blend. I want to try Caramel Vanilla Cream flavor. i would like ot try the Mocha Nut Fudge coffee. pintworks at hotmail dot com. I'd like to try their breakfast blend. Southern Pecan looks like my choice!!! Fair Trade French Roast or Italian Roast. Entered Rafflecopter with hotmail version of my email address. Their Chocolate Raspberry Truffle coffee sound so good! I'd love the Tully's Sumatra Blend! I'd so love to try this - Fair Trade Rain Forest Nut. I would love to try the Fair Trade Vermont Country Blend. I want to try the Golden French Toast Blend. I'd like one of their french presses. I would love to try the Mocha Nut Fudge coffee! Caramel Vanilla Cream...sounds so yummy! Golden French Toast is my flavor of choice! I would like to try the fair trade wild mountain blueberry coffee. Thanks for the giveaway. I would love to try Green Mountain's Southern Pecan and Caramel Vanilla Cream coffee. :-) Thank you. I want to try the Chai Latte.